Where in your home/apartment is your studio located? 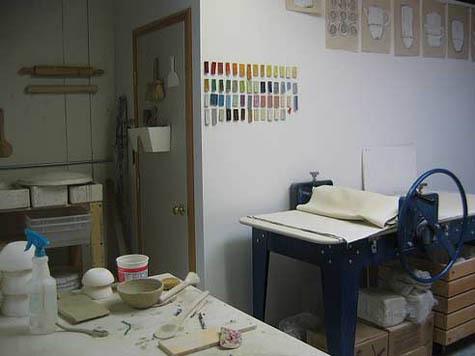 My studio is about three miles from where I live in an area of San Francisco called the Bayview District. When I look out my window this old bus is what i see. 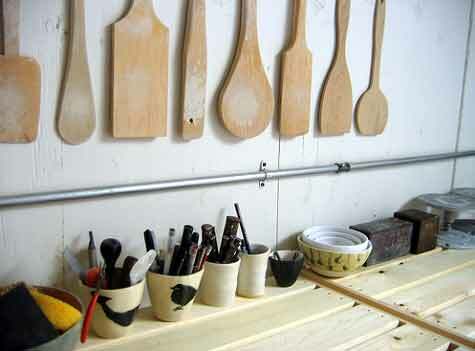 I use a slab roller, kilns, plaster molds most of which I make myself, wooden paddles, rubber ribs, sponges, paint brushes. 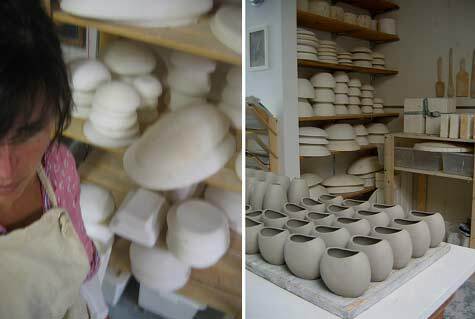 I like to use unusual tools to make marks in the clay. I have many old tools that I have collected throughout the years which include things like old hand forged nails and awls. And of course my most important tools…my hands. Right now I am inspired by multiples of things in different shades of the same color. My most recent creation inspired by this is my yellow vase collection. I used to have an inspiration board once upon a time but haven’t put one up in my new studio. When I moved in to my new studio I wanted a clean slate and not a lot of distraction so I keep external stuff to a minimum. 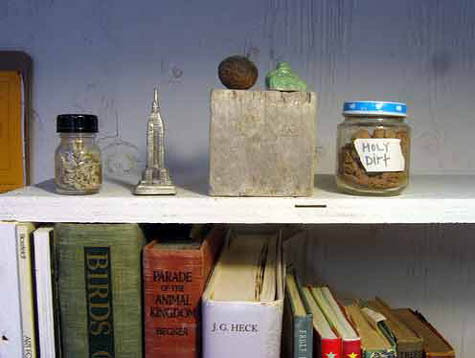 I do have photos up of people who inspire me like Louise Bourgeois , Eva Hess and Jean-Michel Basquiat. I also have drawings I’ve made of pieces that I’d like to make and I have a shelf of weird stuff I like to collect like rusty bottle caps and dirt. listen to music. I love music and have very eclectic tastes so it can be from opera to reggae to the latest pop song to jazz to R & B to hungarian folk music. I love it all! If yours isn’t, what would be your perfect studio? I love the studio I have right now. It has beautiful light and lots of clean white walls and closets to store away things that I don’t want in my way. The only thing I would change is that it would be walking distance from my home and that it would have heat and hot water. Other than that it is pretty darn perfect. Beautiful, beautiful work! I love the drawings and the color selection on clay. Also, how interesting the biography I have read on Diana’s site. yes beautiful work from a beautiful woman! in a beautiful studio:) having been in person, it really is! Great interview! I love the behind the scenes shots as well. Really makes you feel like you’re there with her! 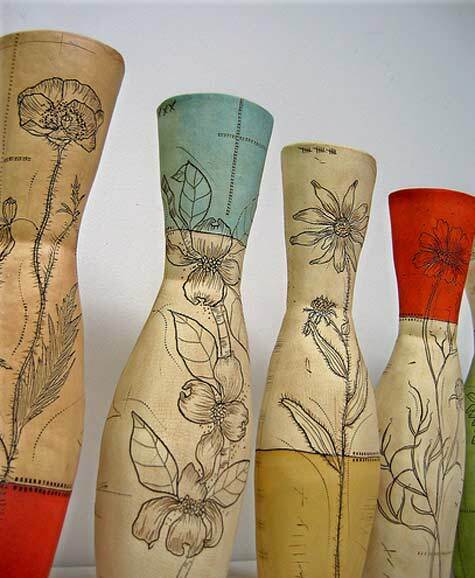 Those vases are absolutely delightful! So fresh!